zmething sinister stirs in the whimsical halls of Wonderland. It's up to Dinah to unravel the mysteries that lurk both inside and under the Palace before she loses her own head to a clever and faceless foe. This one gets a ho-hum. Didn't wow. Didn't annoy me. Just was, and what it was just wasn't enough. It's Wonderland, but not Wonderland. And that's not necessarily a problem. I've read plenty of Neverland-not Neverland stories this year that I enjoyed. In fact, Oakes Wonderland is kind of cool. A wee bit more dark and menacing, and she tried to throw in characters that the reader would be familiar with from the original story. 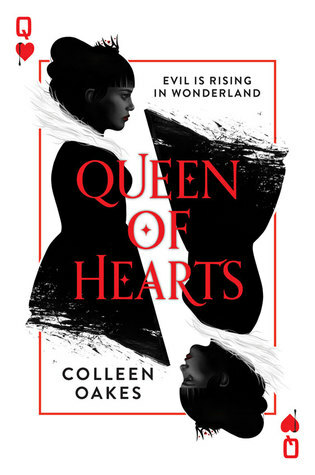 There are card armies (stay away from the Clubs and Spades), the King's advisor is Cheshire, the troubled Prince is known as the Mad Hatter, and of course you have Dinah who will become the Queen of Hearts. The summary is hard, because not a lot happened, and that's my chief issue with the book. Dinah is Princess of Wonderland. Her father, the King of Hearts, is not a nice fellow. He reveals he was unfaithful to Dinah's mother and had a child. Enter Vittore, the illegitimate daughter who has just been named a Duchess. Out of nowhere, Dinah receives a mysterious message sending her into the dark towers, just outside of the walls of the Palace. That's where Dinah "realizes" something awful is going on and her cruel father is in the middle of it. Sometimes plot is put aside a bit for character development and vice versa. Neither of those fit this story, and yet, nothing happens. Dinah moves around a lot because of a "feeling", but the feelings are unjustified in proof and description. Even the things that do happen aren't really explained well enough to make an impact. The characters are one dimensional and the plot a little boring. If you're looking for a fun Wonderland retelling, check out A.G. Howard's Splintered series. There's a lot more depth to that one. Maybe Oakes story will pick up the pace in book 2. The stage has been set and the action can begin. Not sure I'll continue on, but if you do, let me know!